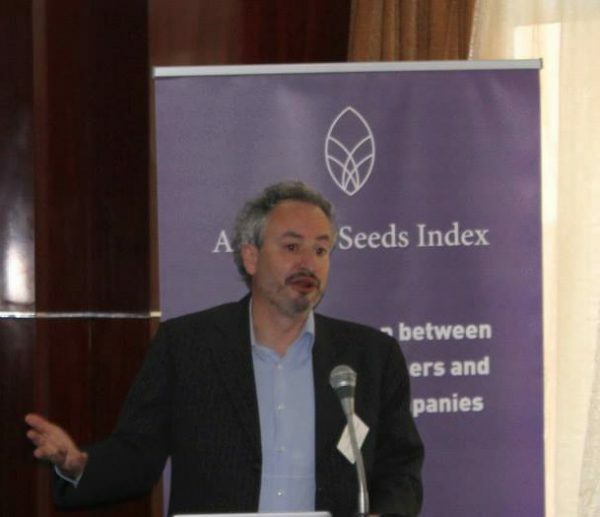 Carlo Fadda, senior researcher at Bioversity International, highlighted the role of seed systems in addressing major global challenges at the Addis Ababa Round Table. According to him, promoting ‘Access to Seeds’ of only the seeds and crops currently available is not the solution that will bring global food security. Broadening the diversity base is essential. Almost 1 billion people suffer from hunger. The world’s population is expected to surpass 9 billion by 2050, creating increasing pressure on already scarce natural resources to meet the growing demand for food. Today about 40% of children under the age of five in sub-Saharan Africa (SSA) are underdeveloped due to malnutrition. Additional challenges like climate change, soils losing productivity, scarcity of water, urbanization encroaching on fertile agricultural land, destruction of ecosystems and increased demand for biofuels and animal fodder create a ‘perfect storm’ in which global food security has to be ensured. The road forward has to be about raising agricultural production in resilient food systems, whilst minimizing environmental burdens like pollutions, emissions and biodiversity loss. 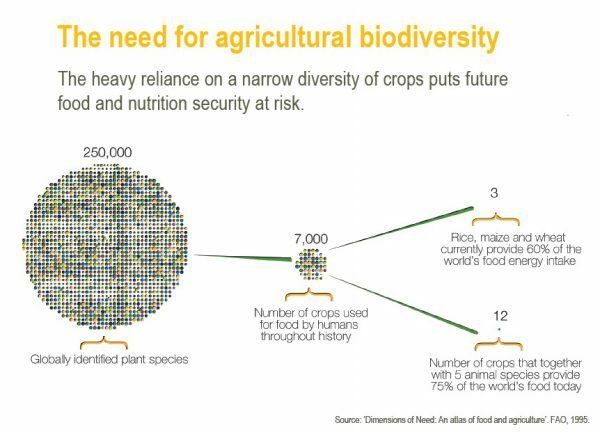 In this light the heavy reliance on a narrow diversity of crops of the current agricultural system put future food and nutrition security at risk. Agricultural biodiversity, which has been used by generations of farmers, is in danger of disappearing. Only three crops currently provide 60% of the world’s food energy intake, making food production extremely vulnerable in times of climate change. Promoting ‘Access to Seeds’ of only the seeds and crops currently available is not the solution that will bring global food security. Therefore Bioversity International advocates a model in which a higher level of crops genetic diversity is made available to small family farmers to increase productive gains while at the same time maintaining resilience against the probability of crop and ecosystem services losses in the future due to external shock. In developing countries the capacity and diversification of seed suppliers, institutions and other stakeholders are enhanced to enable the provision of local crop genetic diversity planting materials in large enough population sizes to minimize risk for smallholder farms in fragile environments. In his presentation Carlo Fadda introduced a model used by Bioversity in which global seed companies could be direct suppliers of their quality seed to smallholder farmers but more importantly could support national seed programmes and national seed multipliers and suppliers with their knowledge and expertise through partnerships, enabling them to supply diverse sets of planting materials empowering farmers to adapt to change.